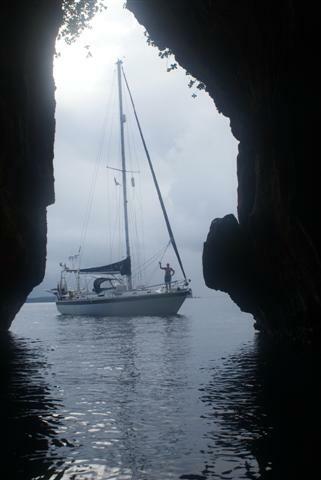 We left Pangai Saturday 21stMay to sail overnight to the Vava’u group of islands. 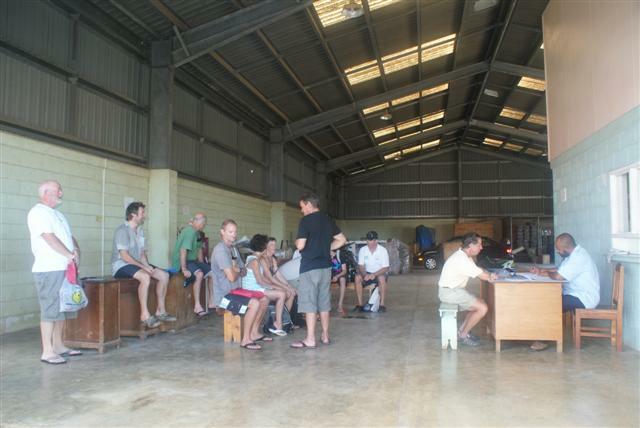 We had a F3/4 southeasterly; perfect trade winds. We motored out of the reef and hoisted the sails for an overnight sail. 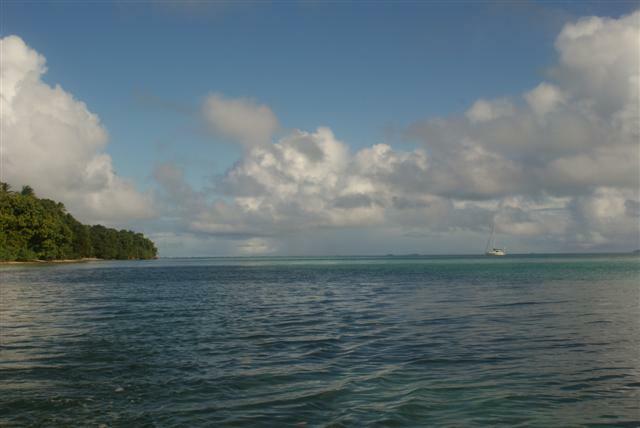 There was a boat following us all the way and when we got into Neiafu, the main town in Vava’u, we discovered it was Riga II a Swiss boat we last saw at Big Mama’s in Nuku’alofa with Gaby and Richard on board. We picked up a buoy in the harbour and went ashore to explore. Sunday’s are reserved for going to church inTonga and absolutely nothing was open. 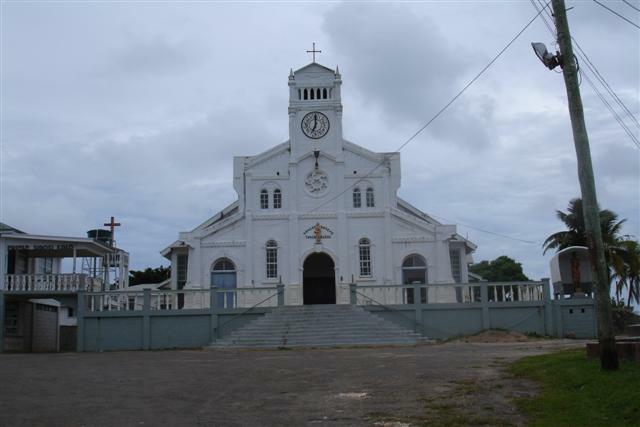 In the evening the big catholic church on the hill was broadcasting hymns accompanied by rock music across the Neiafu, it was bizarre. Neiafu isTonga’s second ‘city’, but it’s still a sleepy little town of 6000 inhabitants. It’s more colourful and appealing than Nuka’alofa. 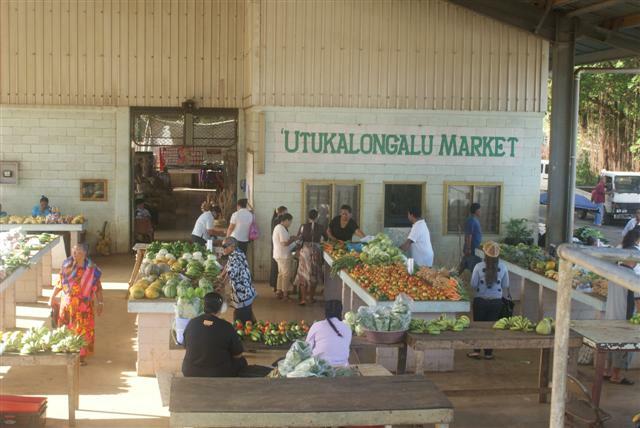 The next morning we all headed back into town to look at the shops and found a wonderful local market selling lots of bananas, pineapples, papayas, long beans, peppers, tomatoes, lettuce, cucumber, onions, and watermelons for very little money. It’s possible to get potatoes but most of the locals eat cassava, which is a root vegetable similar to sweet potato, but a bit of an acquired taste. The ladies on the market stalls were very friendly and even though we were charged tourist prices it’s still very cheap ranging from T$1 to T$3 (35p to £1) a bundle. Although it seems much cleaner here it’s still quite dirty. There is a strange assortment of shops in Neiafu, many owned by the local Chinese community. It isn’t possible to get all your shopping in one place. I spend ages looking around them all to see what they have for sale and then go back to buy it. They may have chicken in one of the freezers in one shop but that same shop may not have kidney beans or coffee. The word ‘shop’ is a very loose term any way because some of them are little more than large garden sheds with very poor lighting and just warehouse racking for shelves. 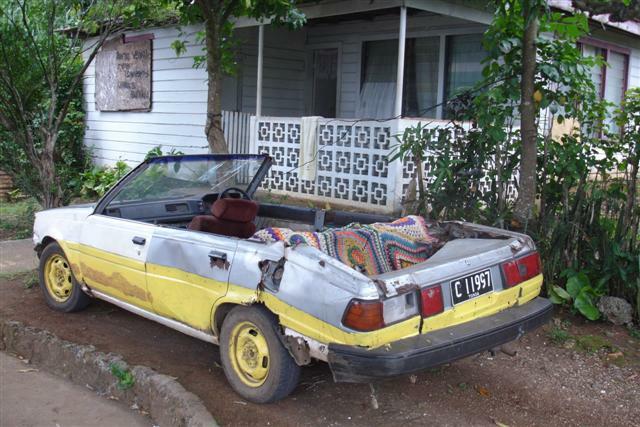 On walking further into the town we spotted this car, believe it or not its still being driven around. Gaby had the idea we should get our hair cut so we went into the local hairdressers where we found two ladyboys cutting hair. 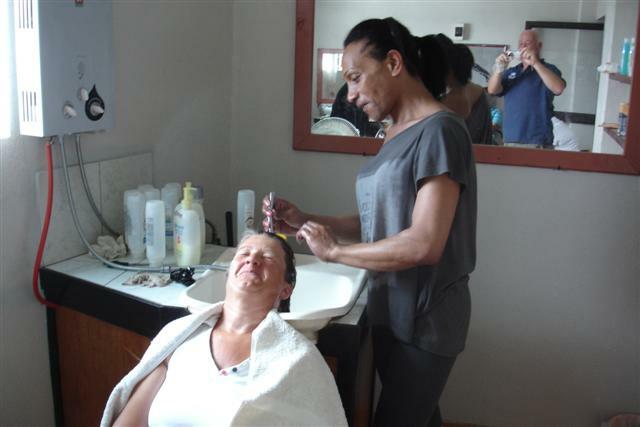 It was ok but not as good as the hairdresser in NZ, the up side was it only cost T$10 which is about £3.50! We spent a week in Neiafu catching up with washing, interneting and boat maintenance. 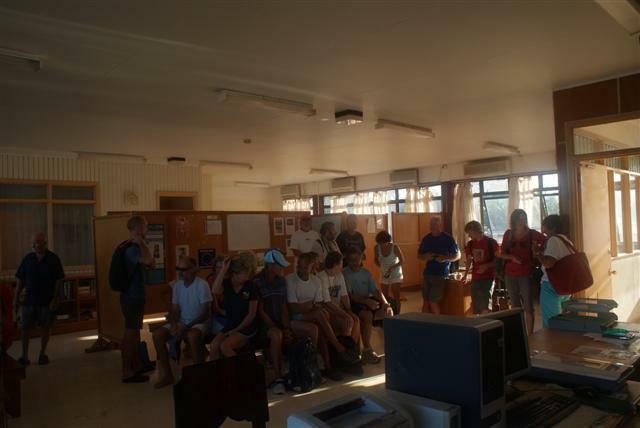 I spent a long time in the local internet café researching the possibility of flying back to the UK for a while to see everyone. 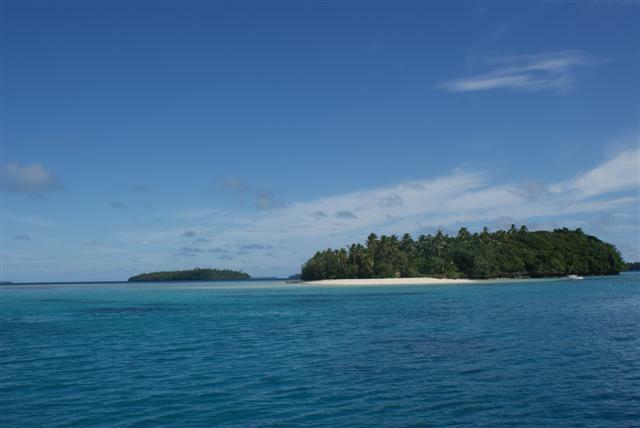 The anchorages around the Vava’u group are beautiful and we stopped at several but the best one was off the island of Kenutu, the most easterly of the islands. 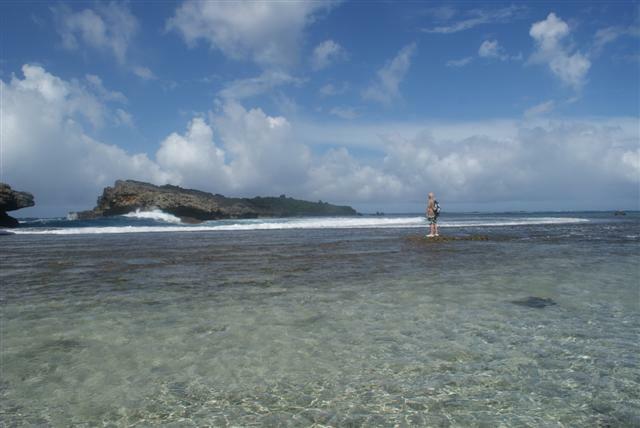 It has quite a difficult approach through the inner reef amongst the coral heads but, with difficulty, we found the entrance after half an hour of looking and were rewarded with a spectacular scene of the ocean waves exploding around the ends of the island. 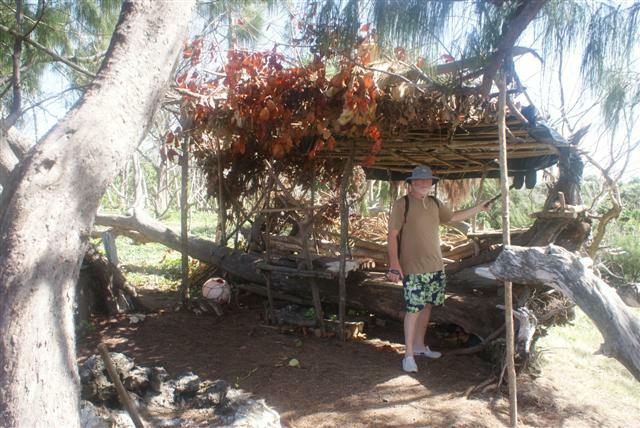 The anchorage off the beach was well sheltered even though the island was on the edge of the outer ocean reef. Beyond it was the South Pacific ocean with nothing between South America and us. 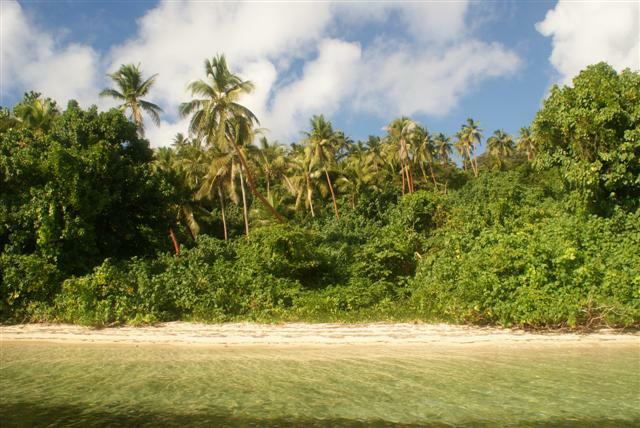 The island is overgrown brush and trees, yet the beach is very attractive. At low tide the undercuts in the limestone are revealed. We found a path leading from the beach to the other side of the island. 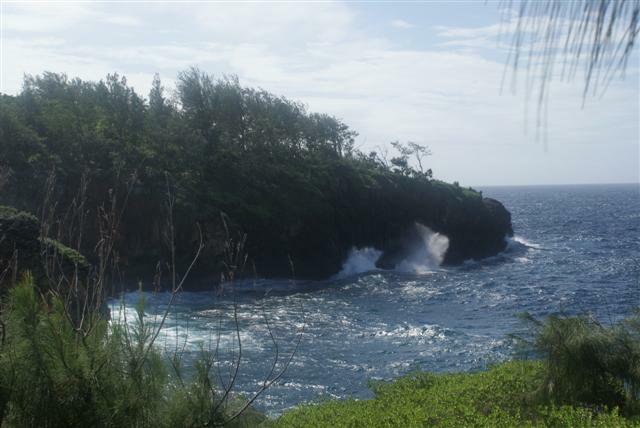 There was a superb view of the surf crashing against the high cliffs on the other side of the island. We had heard the booms from the anchorage. Someone had made a hideout on top of the cliffs, it looked a bit like the bases the boys used to make when they were young. Back on our beach we walked out to the edge of the reef, it was an amazing feeling being that close to the crashing waves which spent their energy crossing the reef and ending up as mere ripples when they got to our toes. 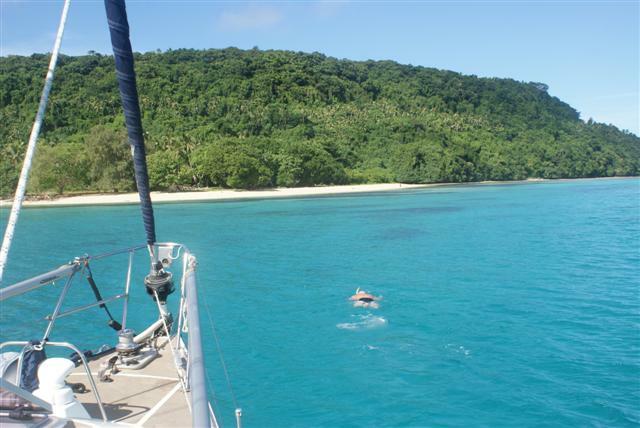 We had the anchorage to ourselves for a further two days before we made our way back through the coral heads to the anchorage at Nuku beach. The BWR had a ‘pink’ party here last year for Charlie’s birthday when she 13, today it was deserted and it really felt like we were too late for the party. The sand was so soft under our feet as we walked around the island. We moved to the anchorage in the middle of the blue lagoon. There seems to be a blue lagoon wherever we go but this one was truly blue. The snorkelling around the edge was superb, so much fish life and colourful coral. Up to this point we had the anchorages mostly to ourselves but we were hearing more and more boats on the vhf as the ICA fleet gradually caught up with us. 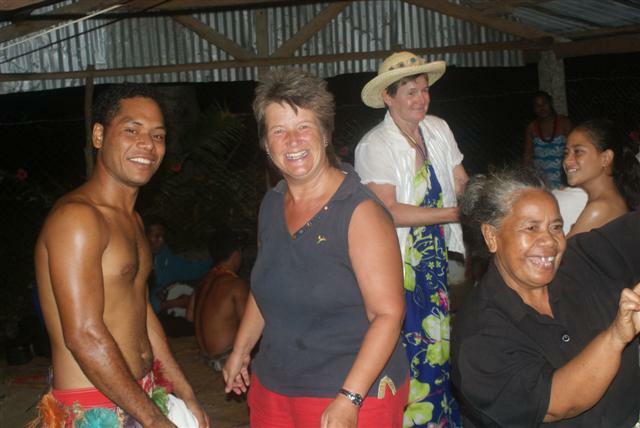 We hadn’t signed up to join the rally until Fiji but we started meeting boats and joining in their activities. 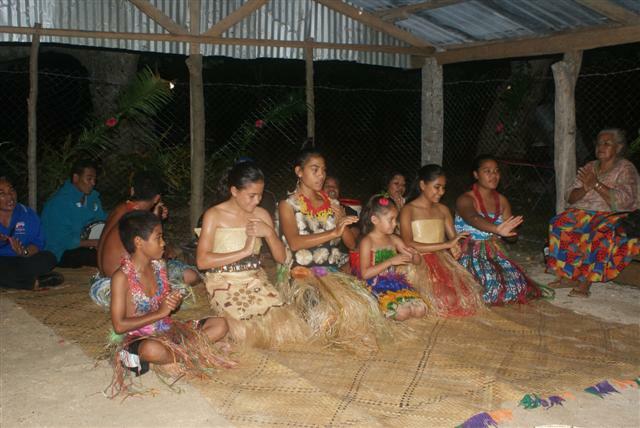 A Tongan feast was arranged one evening, which started with a kava session. 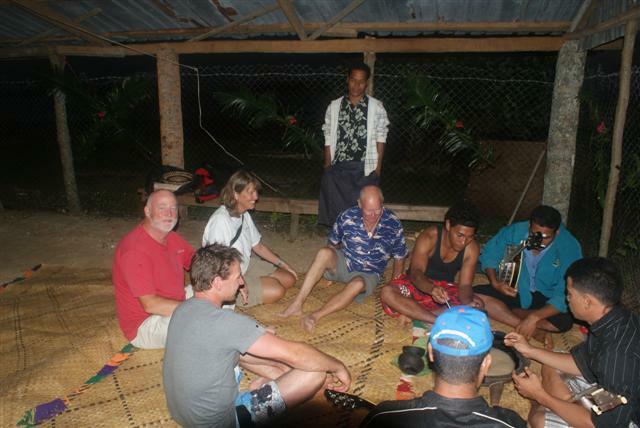 Kava is made from the root of the ginger plant, which is soaked and strained, and then presented in coconut shells while sitting cross-legged. It looks like dish water but tastes worse and has a mild narcotic effect. Bill quite likes it but I worry where the water comes from it’s soaked in. 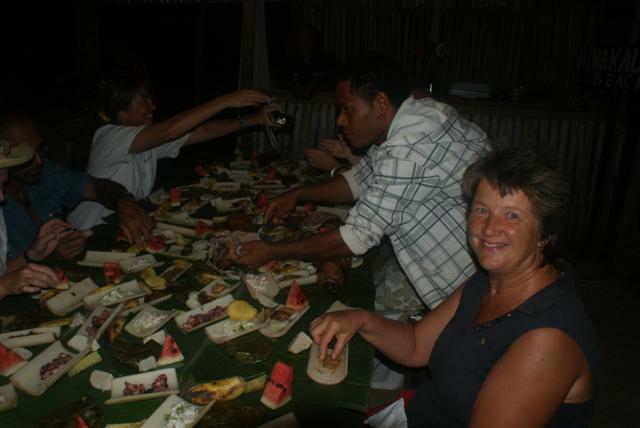 The ‘feast’ consisted of lots of ‘dishes’ served up on bamboo halves with a suckling pig in the centre. It was interesting trying new foods even though we didn’t recognise most of them. After we’d finished eating we were entertained by the local children with traditional dancing, which we all joined in with. Sharon from Larabeck had taken her violin and joined in with the band. We had a wonderful evening. 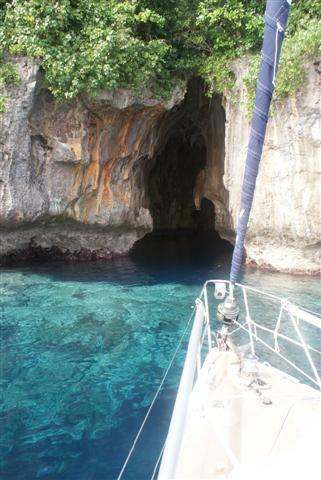 We spent over three weeks in the Vava’u group but before we returned to Neiafu there was one last spot we wanted to check out, Swallows cave. Near the cave the depth is more than 40 metres so anchoring is impossible, there’s also a lot of coral around the edge so care needs to be taken. We poked Camomile’s bow in as close as we dare to take a look but then Bill’s dropped the dinghy so I could go inside while Bill stood off. The intense blue of the deep water was stunning. It was very dark inside and sadly covered in graffiti although some of it dates back to whaling days and so has a certain historical value. The stalactites were just visible among the mud nests of the birds. Although it’s called Swallows cave they were in fact Starlings flying in and out. It’s possible to swim around inside but it was scary enough being in there on my own without getting in the water. There’s also an inner cave where it’s possible to crawl into but even though I haven’t seen the scary cave films there was no way I was doing that so I motored back out again. Posted on May 21, 2011, in Port posts. Bookmark the permalink. 2 Comments. Hello yachtcamomile, I like your blog. yachtcamomile the information on your blog is very informative. Thanks for making this available! Keep it up! Thanks Joe, always nice to know that somebody is out there reading it.